On October 19, 2015 the Florida Gators tweeted that they were looking for a walk-on kicker. 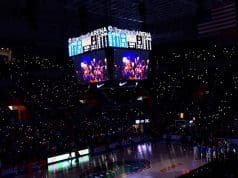 The University of Florida, a school that has a Lou Groza Award Winner was openly asking students that had one working and able leg to come and try out for the team in the middle of a season. That’s where things stood when Eddy Pineiro made his way to campus. Fans were so starved for just competence at the position that they couldn’t help but chant Pineiro’s name any time he trotted out on to the field for an extra point or field goal. 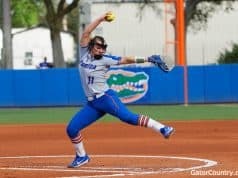 When Dan Mullen arrived at Gainesville he knew of Pineiro but when he met with him it became clear that Mullen would need to find another kicker. Luckily for Mullen he already had a relationship with Evan McPherson, a senior at Fort Payne High School who was committed to Mississippi State at the time. That was the biggest factor in Mullen wanting to reach out to McPherson early. So much of recruiting these days is building a relationship? What is a recruit like? Are there problems at home, how does he fit with your team and the culture? 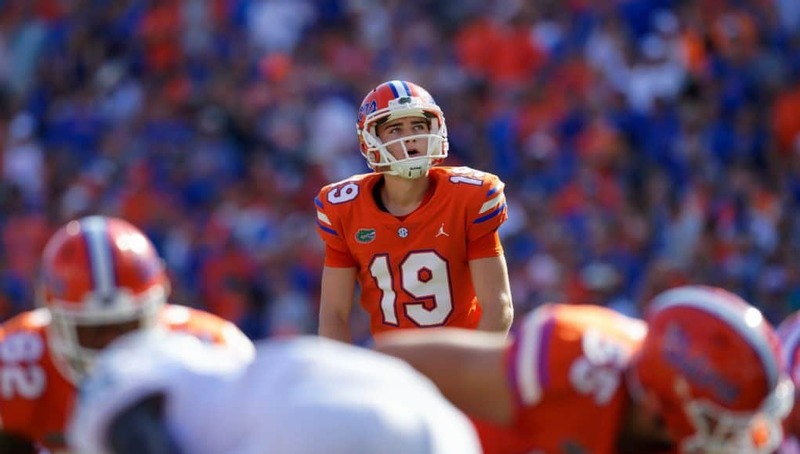 Mullen knew quickly that he would need to sign a kicker and not trying to get McPherson to flip would mean having to go and start that relationship building process with another kicker all over again. McPherson says Mullen called him to reach out the Monday after he was introduced as the head coach of the Gators. That’s not too far from Jim McElwain making his first recruiting trip after the dead period to see Pineiro and the strategy worked for both. McPherson didn’t win the job right away. The battle to be the starting kicker went all the way into the first game. 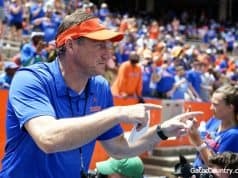 That Monday Mullen was asked about the competition and he said he would probably need to see how each kicked on the field before the game because kicking on a practice field and kicking in Ben Hill Griffin Stadium were very different. McPherson won the job and hasn’t looked back. The true freshman has converted all 25 of his extra points and is 11-12 on field goals with the only miss coming on a controversial — to say the least — call in the second game against Kentucky. His demeanor is unusually calm for a freshman and he’s picked right up where Pineiro, one of the most popular kickers in school history left off. With McPherson kicking it looks like Florida won’t be holding open tryouts for a new walk on kicker any time soon.